Maintaining provider income will continue to be a key priority for practices nationwide in these times of regulatory uncertainty. Answers to the revenue problem have never been simple, but now physicians must deal with increasing patient responsibility and decreasing payer reimbursement. There's more to the issue than simply cost containment. Practices must adopt a holistic view of expenses and observe their cash flow closely so they can maintain–and possibly even increase–their revenue. Other means like diversifying service offerings and attracting more of the right patients will lead to more revenue for the benefit of all. By being proactive and constantly vigilant, physicians ensure healthy revenue streams for themselves and their practices. When provider income stabilizes, practices are able to provide better services for patients. 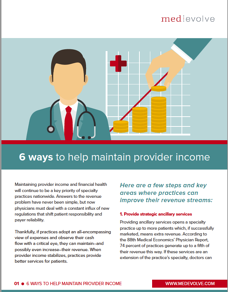 Download our article to learn six ways that can help maintain provider income for your practice!